Homer gets a new job that's very similar to mine, and Krusty tries his hand at the circus while on the lam. All this and more on an episode of The Simpsons that will hopefully be better than some of the recent editions. The elementary school paper is losing money, and Skinner is bringing in a new editor: Billy. He makes a lot of changes, none of which make sense. Lisa is told that she has to be a TV recapper (like me!) and she's not happy (don't knock it 'til you try it, Lisa!). She makes Homer do it instead, because she thinks he's better suited for the position. He'll be recapping The Krusty Show, which catches the attention of Krusty himself. Homer gives bad grades to multiple episodes, so Krusty decides to do what all sane people do when their show gets bad reviews: kill Homer. The ensuing car chase ends with both of them getting injured. Before Wiggum can arrest Krusty for the attempted murder, Bart helps him escape to a circus. Krusty goes undercover at the circus as a new clown, Soggy. Meanwhile, some fans greet Homer and offer him a job, which he accepts. 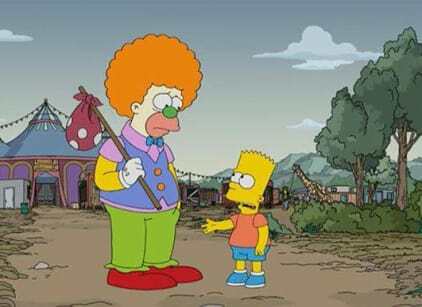 Krusty/Soggy has his first show with the circus, and he fails miserably. Homer starts recapping everything his life, and Marge gets angry and gives him an ultimatum: her or the job. Krusty/Soggy gets fired from the circus, but he gets to do one last show before going. That last show goes better than the last one, and it leads to him getting his job back. Krusty/Soggy gets an offer to be a part of a Japanese game show, but he declines because he loves him life as a circus clown. Then, the ringleader announces that the circus will be shutting down. Homer announces his resignation as a recapper, and a businessman threatens him over it. Krusty/Soggy saves the circus by allowing the circus to turn him in for the reward money. However, Krusty is later found to be not guilty, because his crime was in self-defense. The members of the circus still don't accept Krusty, because he just doesn't fit in being a TV clown. He returns to his old job, where he's ecstatic to learn his recent episode has gotten an A grade. Little does he know that it's actually from Ralph, who is just too dumb to actually give it a grade. I enjoyed this episode more than I've enjoyed any episode of The Simpsons so far this season. While it wasn't perfect, I did find both plots to be very entertaining and both had some thoroughly funny moments. While the conclusion to the Homer plot was a little strange, it gave for some of the most comical and memorable moments in the episode. It was a pleasant surprise to see Krusty get a substantial plot this time around, as he's been somewhat neglected as of late. His plot was also pretty strong, and I thought the conclusion to it was clever. The show taking on online reviewers was pretty interesting for being, being an online reviewer and all, and I must say: it's not quite as glamorous as the show made it out to be. Still though, it was a pretty cool thing to see.